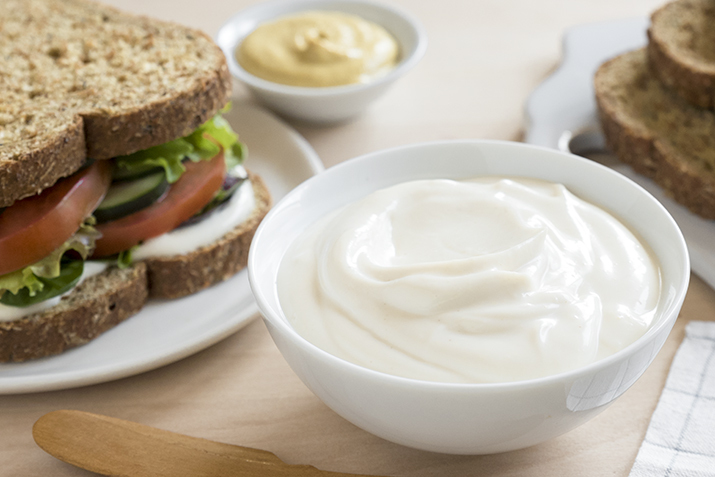 Some aquafaba mayo recipes are made with just aquafaba and oil, with no other base. I like to put in some creamy raw cashews, to give this spread some weight, as well as a little nutrition bonus from the nuts. Be patient as you add the oil; the slow process ensures that the oil and water mixture is fully emulsified, and won't separate later. In a blender, combine the aquafaba, cashews, garlic, lemon juice, Dijon and salt. Secure the lid and process, starting on a lower speed and increasing until the cashews are smoothly pureed. Stop and scrape down any bits of cashew that are on the sides of the blender container. When the mixture is smooth, remove the plug from the lid and replace the lid. Start on low speed, increase to high and process for 4 minutes. Drizzle in the canola oil very slowly, in a thin stream. It should take a couple of minutes to incorporate it. Drizzle in the olive oil in the same manner. Scrape the mayo into a storage tub or jar and refrigerate. It will thicken more as it chills. Keeps for up to a week, tightly covered.